Shaver’s Creek partners with many academic colleges across Penn State to offer courses in environmental interpretation, outdoor/adventure education, and leadership. Every spring, students interested in these subjects can also take the Shaver’s Creek SEED Semester, an experiential journey for students. Shaver’s Creek’s undergraduate programs are listed with many departments around the University, including Recreation, Park, and Tourism Management (RPTM), Ecosystem Science and Management (ESM), Science Education (SciEd), Engineering (ENGR), Leisure Studies (LE ST), and more! 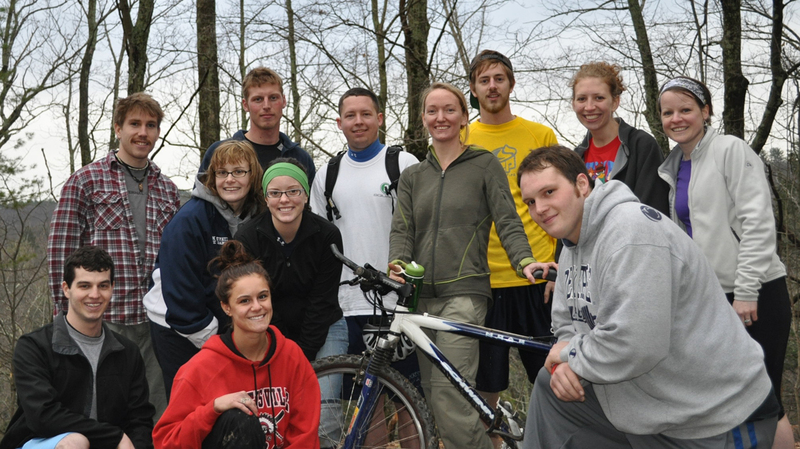 Some of our courses also count toward the Intercollege Minor in Sustainability Leadership. While some of our classes meet on campus, many are held at the center. 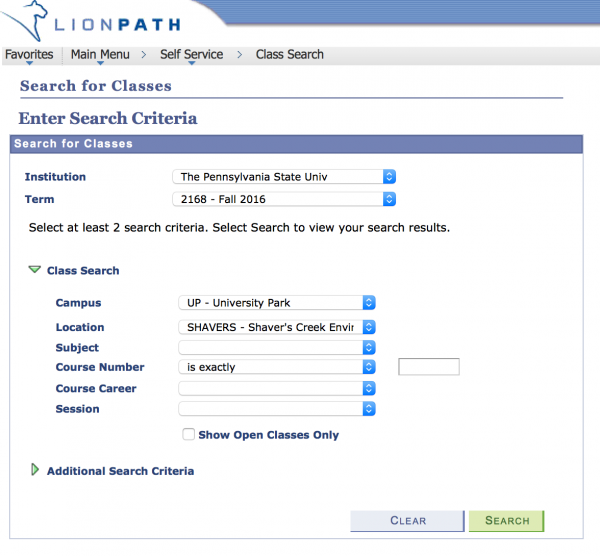 To see a list of all Shaver’s Creek classes, visit LionPath’s Search for Classes menu. Select “University Park” as the campus and “SHAVERS” as the Location. Shaver’s Creek classes will also show up if the Location field is blank (but they will NOT appear if the Location field is also set to “UNIVPARK”). Please note: Some courses have registration controls and may require acceptance by the instructor. If you do not find a course listed in the schedule of courses, please contact us at 814-863-2000. Many of Shaver’s Creek’s public programs and festivals are designed to offer Penn State students a hands-on, for-credit experience interpreting natural and/or cultural history topics to families. Our two festival courses dovetail with the two major festivals that Shaver’s Creek hosts every year — the Maple Harvest Festival and the Fall Harvest Festival featuring the Children’s Halloween trail — and allow students to apply their course learning directly to a real-world event that reaches thousands of adults and children. Learn to interpret the natural origins of Halloween to visitors attending the annual Shaver’s Creek Fall Harvest Festival featuring the Children’s Halloween Trail — an interactive family event (in late October). Learn the process of maple sugaring and how to interpret this natural history process to the general public through an interactive, community-based festival — the Maple Harvest Festival (in late March). This experiential course will explore how to identify and tap sugar maple trees, historical and modern methods of boiling sap into maple syrup, and interpretive methods for teaching the general public the art of maple sugaring at the Maple Harvest Festival in late March. For more information, please see the flyer for 2019 or view information about our Credit Courses. This course will give you leadership experience with grade school–aged children in a residential outdoor education program. You will attend one full-day and two evening training sessions to prepare for Outdoor School. You will serve as a cabin counselor; manage participants at meals, during cabin time, and in lessons; assist instructors in learning groups by leading activities and portions of lessons; and teach a cultural history lesson. This course sometimes counts toward the Intercollege Minor in Sustainability Leadership. Field identification of native and introduced trees and shrubs by leaf, fruit, twig, and bark. Outdoor School is an environmental education experience for teachers, counselors, and fifth-grade children. This class is for students who will lead the counselors and learning groups. This course surveys common herbaceous plant taxa occurring within forested habitats in Pennsylvania and the region. Botanical characteristics, ecological interrelations, commercial importance, and field specimen collection methods are covered. Prerequisite: 3 credits in plant or biological sciences. 3 credits; offered fall semester. This is a prerequisite for the SEED Semester. Forge a connection between the interests of an audience and the meaning inherent in our natural resources. Use interpretive techniques and short presentations in such programs as the Children’s Halloween Trail in October. This course counts toward the Intercollege Minor in Sustainability Leadership. 3 credits; offered spring semester. Limited to SEED Semester students only. Learn the basics of identifying birds, trees, wildflowers, and more. Learn to read the natural landscape and tell the story of the ecology of the Eastern Forest. 3 credits; email Shaver’s Creek for details. Students experience an active semester of learning content and skills, experimenting with methods and materials, exploring the relationships between natural history and cultural history (a holistic base), and developing and delivering quality interpretive experiences in a variety of settings. Survey of common nonnative (“exotic”) herbs, forbs, shrubs, trees, and vines that invade forested habitats in Pennsylvania and the region. Field identification, life history traits, ecosystem-related challenges and problems, and management options and considerations are reviewed. Prerequisite: six credits in plant or biological sciences. Discover methods and materials for developing, implementing, and evaluating environmental education programs in formal and nonformal educational settings. This course counts toward the Intercollege Minor in Sustainability Leadership. Ecologically oriented field study course to provide teachers with basic knowledge of natural science resources in school environments. The Shaver’s Creek Field Laboratory is Penn State’s home for courses in outdoor group management techniques, adventure leadership, and team-building skills. Shaver’s Creek faculty bring to these exciting and challenging classes their extensive experience in the fields of outdoor education and adventure recreation. Shaver’s Creek is also home to AURORA, Penn State’s Outdoor Orientation Programs, which runs 5 of the nation’s premier first-year student orientation programs. Supervision in recreation services, including theories, strategies, group dynamics, applied leadership and decision-making skills. RPTM 236 Leadership and Group Dynamics in Recreation Services (3)The primary objectives of RPTM 236 are for students to examine both leadership and group dynamics as a function of leisure and recreation services. Students in RPTM 236 will be given a variety of leadership opportunities, both in and out of class, to begin to develop leadership skills as well as observe others in recreation leadership positions. Information on leadership theory and group dynamics (group development, roles in groups, group decision making) will be provided through group exercises and hands on experiences. Main topics include: Leadership theory; Approaches to leadership; leadership styles; Definition of group including characteristics and effective group management; Group decision making and problem solving; Recreation leadership skills including behavior management, interpersonal skills and motivation; Teaching as a leadership skill; learning theory; Communication as a leadership skill; Teambuilding RPTM 236 is a required course for RPTM majors. Students in other majors are welcome. It is strongly suggested that RPTM 236 be taken prior to, not concurrent with RPTM 356. Both theoretical and experiential components are included as the role of the leader in adventure programs is examined. This course will focus on the philosophy, leadership techniques, ethics, and current practices in the area of adventure programming. Focus of instruction will be upon program design, developing skills for facilitating personal growth and providing leadership for outdoor pursuits. This course is designed to equip students with a variety of outdoor program-planning methodologies and skills. Emphasis is on planning, organization, implementation, and evaluation of outdoor experiential education programs. Outdoor topics, theories, and systems will be explored to facilitate the administration of quality adventure-based programs. Kinds of environments; past and present uses and abuses of natural resources; disposal of human wastes; prospects for the future. Students who have passed BIOL 220 or any other upper-level ecology course in biology may not schedule this course. BISC 3 Environmental Science (3) (GN)(BA) This course meets the Bachelor of Arts degree requirements. BISC 3 will help the student to prepare for living in current and future society’s mixture of technology and mythology by presenting ideas and concepts about living systems and their environments. Policy makers and citizens are urgently needed who can act with an understanding of ecological principles when exercising community responsibilities to handle the environmental problems of our times, such as water use, solid waste management, global warming, energy use, conservation of irreplaceable natural resources, overpopulation, and the preservation of biodiversity. An understanding of biological and ecological principles and their application towards environmental challenges should give the student the confidence to be a trustworthy and active citizen, a conscientious steward of nature, and an agent of change for making a healthy, sustainable community and society. Regardless of the students’ field of study, as a citizen of both local and global communities some environmental issues will impact their lives. The course objectives are to enable students to: * Develop a basic understanding of how ecosystems and biological systems work, learn how economic systems depend on natural capital, biological/chemical processes, and the function of ecosystems * Develop a fundamental understanding of sustainability * Understand the scientific basis of specific environmental problems * Understand the significance of environmental legislation and the impact of increased citizen awareness on improving the quality of life we enjoy today * Further develop the ability to evaluate their contributions to shared environmental problems, identify ways to minimize their impact on the environment, and contribute to the development and maintenance of a sustainable future. Teaching Assistant course for BiSc 3. A course on thinking critically about issues related to race and ethnicity in American society. Supervised experience as a teaching assistant for SOC 119 under the supervision of an approved faculty member. Prerequisite: SOC 119 and by application.